Vinsetta Garage – Done 6/16/12! On Saturday I crossed a place I wanted to eat off of my list! 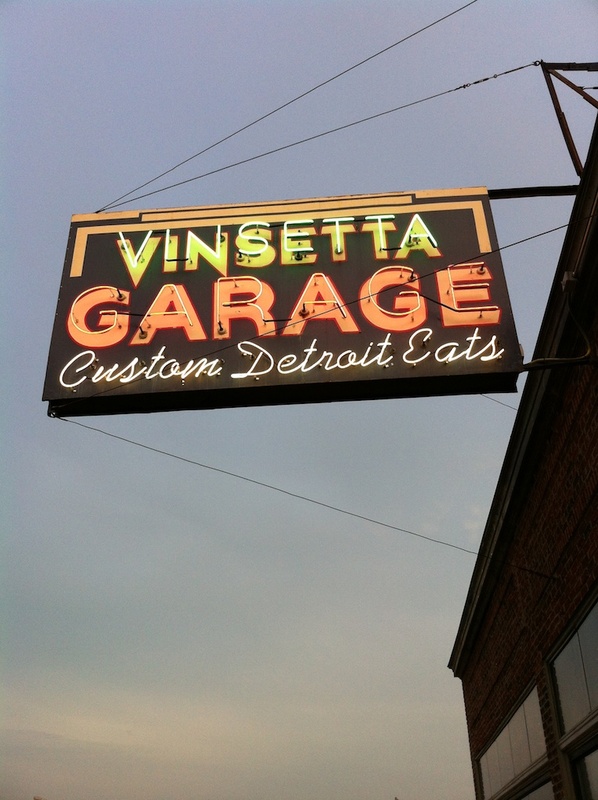 The newly opened Vinsetta Garage has Detroit buzzing and for good reason. The same duo behind Clarkston Union has repurposed another historic building and made it into something new and exciting. The decor is industrial and you can tell they took great care to preserve the look of the 90 year old service station it used to be. Outside, two old gas pumps have been updated and turned into electric car charge stations. We waited 2 hours, but we waited in comfort at a large table outside of the restaurant. Wait staff offered us water and about 15 minutes before our table was ready, a guy with a plate of wood-fire oven garlic bread came out. 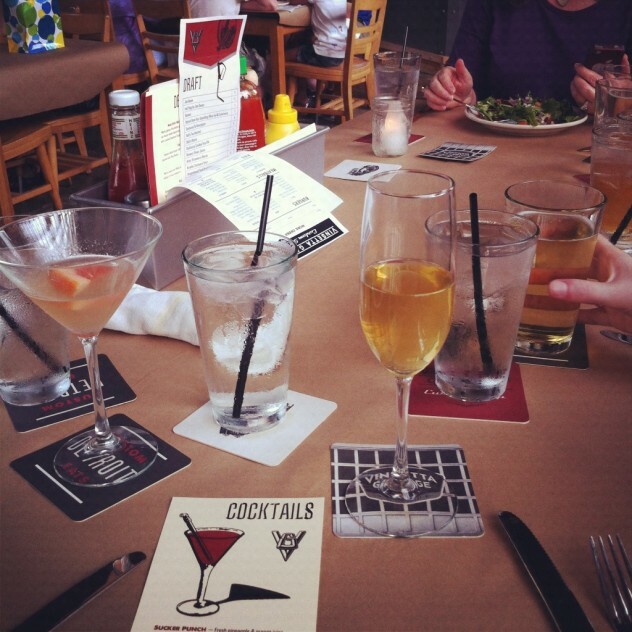 Our party of six was not letting that guy walk by without stopping at our table! Oh man, those pillows of dough with a brush of garlic were heaven. We were seated in a huge booth with gorgeous brown tufted leather. 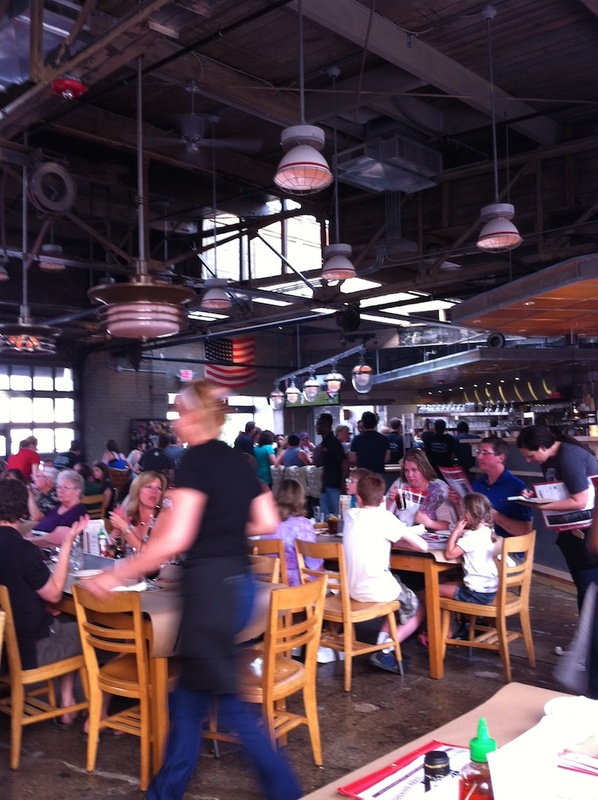 It was a great spot for people watching and for checking out the details of the restaurant. Block glass behind our table bathed us in beautiful natural light. The guys at the pizza station had mechanic-style shirts on while the wait staff was dressed in denim and different Detroit t-shirts. Our napkins were shop rags and the menu is placed in a sleeve that mimics the sleeve to hold a mechanic’s work order form. Everything revealed owners who really took pride in their establishment. I noticed that the diners around us were a mix of young and old, families and single people, but leaning more towards the baby boomers. The history of this garage has no doubt brought out people that remember the Vinsetta Garage of the past and were interested in the new look. My Dad is definitely a gearhead that attends car shows every year and I kept thinking how much he would love this place. 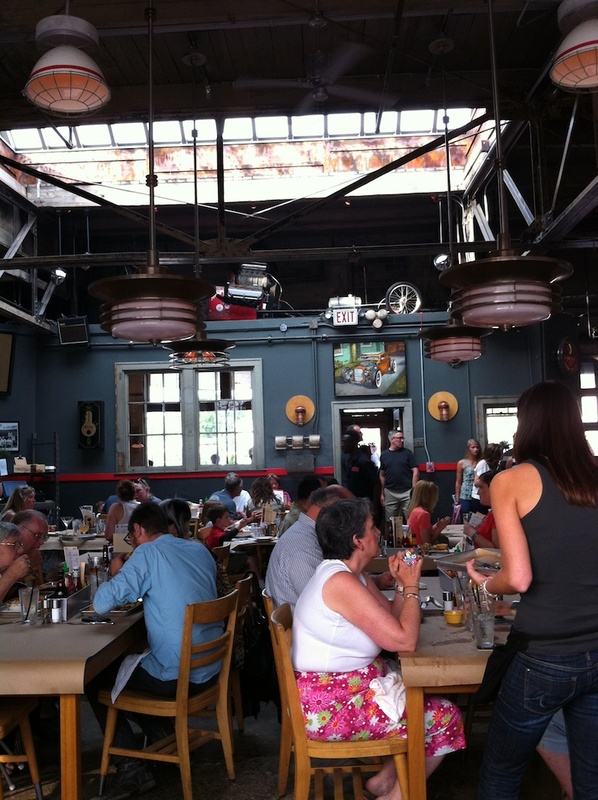 The restaurant is located on Woodward Avenue, known for the Woodward Dream Cruise. Over a million people worldwide come to see classic cars drive down Woodward every summer. A few classic cars drove up and revved their engine while we were waiting for our table. It was hard to choose a cocktail, because they all sounded great. Marc ordered the Dyno: Hendrick’s gin, St. Germaine, grapefruit juice and tonic and I ordered the Detroit Locker: Maker’s Mark, Detroit sparkling wine and muddled honeycomb. Marc’s cocktail was beautiful and refreshing. Mine was good, but the sparkling wine was the main thing I tasted and I was more excited about the Maker’s and honey. Still very good, though. 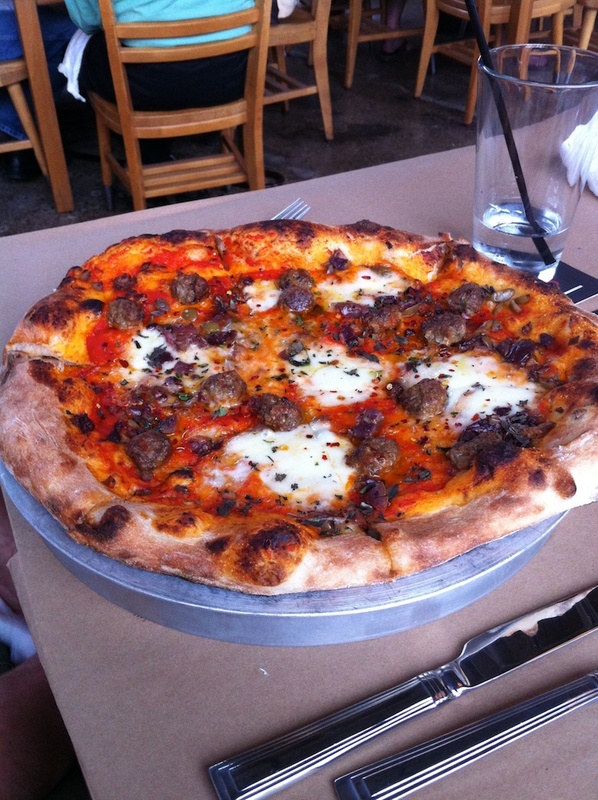 The dinner menu has wood-fired pizzas, outrageous burgers and pasta with meatballs. They even have paper forms where you can customize what you want in a pizza, burger or pasta creation. Marc ordered the meatball pizza thinking that if they specialize in both meatballs and pizza, that the combination must be even better. He was pretty spot-on. The crust (which we sampled earlier) was soft and chewy and the toppings were full of flavor. I had one delicious, oregano-scented bite and I wanted more, but I needed to turn my attention to the behemoth before me. I ordered the 3 am burger which is their beef patty topped with onion straws, sriracha mayo and a fried egg on a pretzel bun. 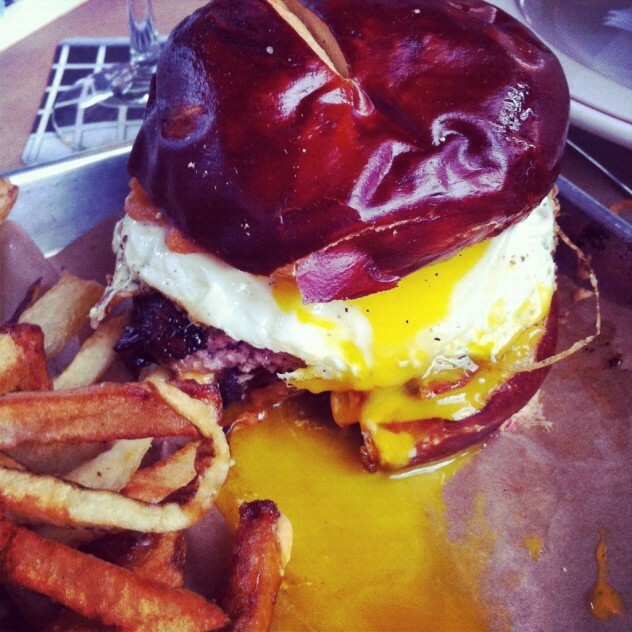 You can be sure that when I put the lid on that bun, the bright yolk oozed all over my plate in the best way. I traded housemade chips for fries and I loved them, but obviously couldn’t eat many. The fries came with a mystery sauce with familiar flavors. It seemed Asian inspired and the best I can come up with is a teriyaki mayo. Call me crazy, but I preferred dipping my fries in the runny yolk. I got through about 80% of my burger and then renamed it the “one-night stand” burger because it sounded like a good idea at the time, but I regretted eating so much afterward. Post-food coma, I can now say it was one of the best burgers I’ve ever had. My friend, Allison, customized her pasta and meatballs and if you can believe it, I managed a bite of her food, too. It was delicious! So much so, that I think the combination would be a winner on the comfort food menu. 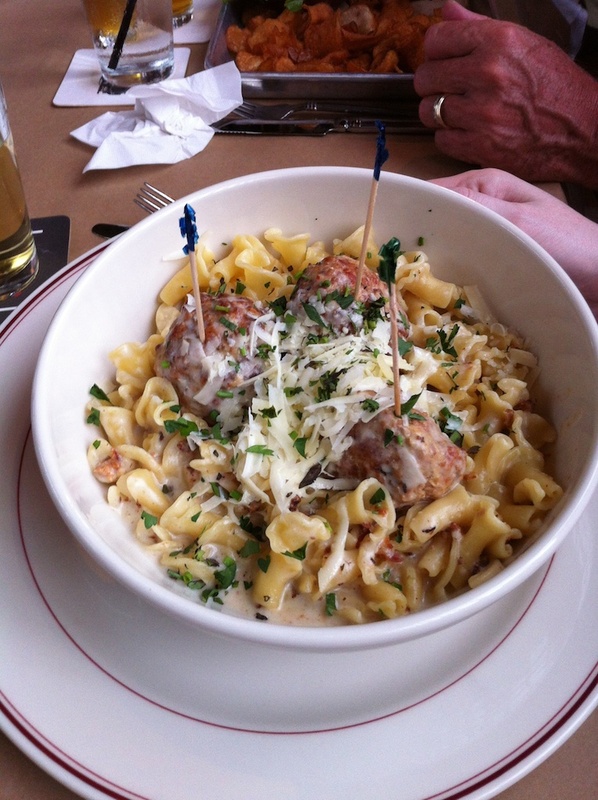 She went with sweet pork meatballs over pretty campanelle pasta tossed in a bacon and pecorino sauce. I should have snagged a picture of her order form where she boldy circled bacon, ha. Our stomachs were full and we loved the experience. We even saw the waiter that helped us at the Clarkston Union and he kindly stopped to chat. Our wait time was a distant memory as we walked to the car. So glad to hear you had such a good experience! I’ll pass it along to Curt and Ann! I’m so excited to head there myself – I’ve been eager to see it in person ever since it was just hush hush whispers that the restaurant was happening! Have you heard about their plans for the Fenton Fire Hall? So much good stuff! Emily – You will love it! I have heard about the Fenton Fire Hall and those plans sound exciting as well! oh, man! it looks so good! I definitely have that place on my list as well. I’m glad to know the 2 hour wait was worth it! Cindy – We had a wonderful time and I’m sure you would, too! I agree the burgers are great here (I had the Lamb burger – good flavor), however my wife had the flank steak, and this one item will make us come back for sure!!! Rich – I’ll make sure to try the flank steak next time! Sounds great. So glad I live in Berkley, this place rocks. Great food, excellent ambiance and outstanding waite staff. Cheri – The customization options are fantastic! Sues – If you ever head this way, let me know! The Detroit area has so much to offer!